This comedy takes a riotous look at small town Welsh country life centered around competing funeral homes. BORIS PLOTZ, Director of Plotz Funeral Homes, dreamed of only two things as a young boyÉdancing and BETTY. Betty secretly loved Boris, but could not fight her father’s wishes, so she was married off to a gold digger. Boris gave up his dreams and took over family’s undertaking business. Everything remained status quo until Betty’s mother-in-law dies. Boris and Betty are thrown together to discuss the funeral arrangements and old spark is re-kindled. Meanwhile, a rival funeral director, an American, FRANK FEATHERBED, is determined to revolutionalize the undertaking business through the innovation of “theme” funerals. Boris and Betty discover that the only obstacle between their love for one another, is Betty’s marriage to the two-timing Mayor. In a desperate bid for happiness Boris and Betty decide to stage her death and run away together. Boris pursues the plan for faking Betty’s death by enlisting the help of the town doctor. But still, nothing goes as planned and so the comedy begins. 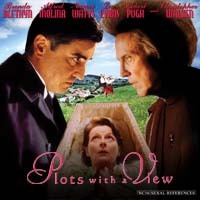 “Plots with a View” is a Welsh film about a Welsh town that consists of relatively un-Welsh leads. Strangely enough, the US title of this film is called “Undertaking Betty”, which honestly, sounds much better suited with the plot. It goes something like this. Boris Plots (Alfred Molina) is a funeral director who is still harbouring a 30 year crush on Betty Rhys-Jones (Brenda Blethyn). Sadly, Betty is married to the town’s councillor, who is having an affair with his secretary played by a pre-Mulholland Drive Naomi Watts. Boris and Betty soon discover that they’re made for each other and plan to stage Betty’s death in hopes they’ll be able to run away to Tahiti. As this comedy ensues, Frank Featherbed (Christopher Walken), an American who wishes to revolutionize funerals, appears and hopes to be the one who can direct Betty’s funeral to become the leading funeral director in town. This romantic film is not typical of the popcorn driven ones of late. Rather, it is a story of middle-aged lovers who prove that at that age, they can still be as star-crossed as Romeo and Juliet. While the cast does relatively well, Christopher Walken, steals the show as he always does. As the funeral director bent on being the future of funerals, Featherbed conjures a funeral with a Star Trek theme for an old lady complete with music, rising capsule and of course, Dr. Spock’s ears. Although this film is a charming one, I wasn’t really enjoying myself. The whole notion of faking one’s death seemed a bit too farfetched and the whole funeral bit appeared wild. But, I guess one must watch this film with an open mind. Pick up the DVD and try to enjoy the film. It might just charm your socks off in a dysfunctional way. “Plots with a View” isn’t fitted with any special feature. It would’ve been nice though to know how the screenwriter conjured the feuding funeral directors bit of the plot. The DVD comes in English Dolby Digital 2.0. A blend of green plains and grey stone streets capture the mood of the Welsh country. The characters are dressed in colours which represent their identity. For example, Betty was dressed in purple, pink and light green to reflect her buoyant nature while Meredith (Naomi Watts) was decked in black leather and striking red to represent her naughty nature. Bright lights and brown hues were also used in sequences to bring about a nostalgic touch to the film. DISCLAIMER: Images, Textual, Copyrights and trademarks for the film and related entertainment properties mentioned herein are held by their respective owners and are solely for the promotional purposes of said properties. All other logo and design Copyright©2004-2005, movieXclusive.com™ All Rights Reserved.